Cherry blossoms of faith and Yoshino mountain Great views of gradient cherry blossoms! 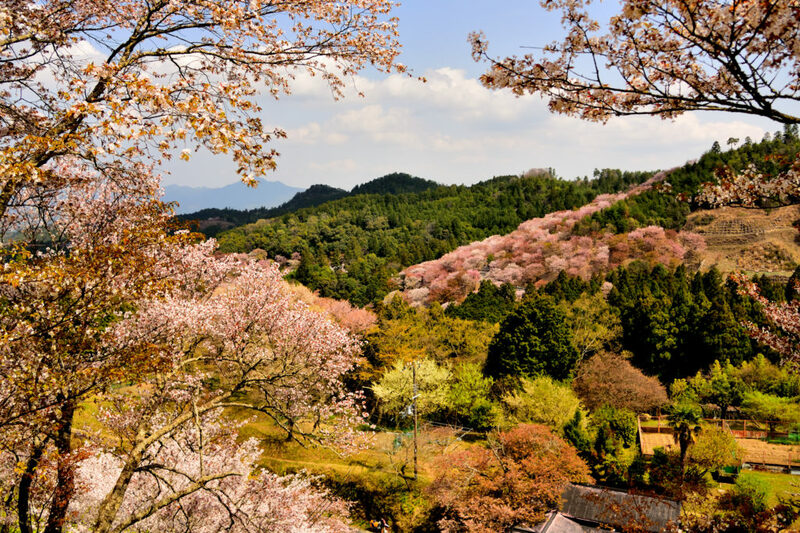 Yoshino mountaion in Nara Prefecture is known as the best cherry blossom spot in Japan. Mount Yoshino in the central area of ​​Nara Prefecture is a place rich in nature, and is known as the sacred land of Shukendo and the origin of famous trees. In 2004, it was registered on the UNESCO World Heritage Site as a component of "Sacred Sites and Pilgrimage Routes in Kii Mountains". It is said that the first trees were planted along its slopes more than 1300 years ago, and today the mountain is covered by approximately 30,000 cherry trees of many different varieties, especially of the Yamazakura variety.And the people who live there have been carefully protecting them from generation to generation. Yamazakura is a representative species of wild in Japan, and unlike “Someiyoshino”, which was born in the Edo period for ornamental purposes, it is known for its long life and large tree. In Yoshino, where around 30,000 cherry trees are inhabited around Shiroyama cherry blossoms, there is variation depending on the climate of that year, but the beginning and end of April will be the full bloom of the cherry blossom. 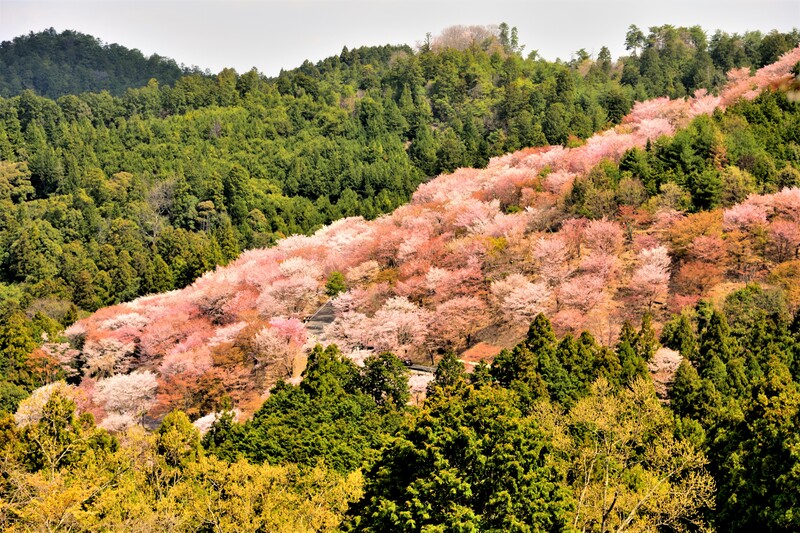 The cherry blossoms of Yoshinoyama consist of four areas, Shimo Senbon (lower 1000 trees) at the base of the mountain, Naka Senbon (middle 1000 trees), Kami Senbon (upper 1000 trees) and Oku Senbon (inner 1000 trees) at the top of the mountain. Flowering in the order of low elevation from the bottom of the lower 1000 to the middle, the top and the back, it is also one of the attraction that you can enjoy the full bloom of cherry blossoms for a long period of about one month. Among them, the aim to enjoy the most cherry blossoms is the time when Nakasen cherry blossoms reach their peak. The cherry blossom front in 2018 was about a week earlier than usual, and in early April, Nakasen cherry blossoms were in full bloom. The slopes of the mountain, dyed with fresh green and cherry blossoms, provide a striking contrast and lighten the footsteps of travelers who climb the mountain. It is a symbol of Yoshinoyama, and it is the main mountain of Shugendo, and it is possible to look at Kinutan-ji Temple far. After training in the mountains, an officer who is considered to be the founder of Shugendo, engraves the figure of the Kongo Zao Gongen in the cherry blossom tree, and it is the beginning of the Kinutan-ji Temple that scolded this. Since this time, cherry trees have been planted as sacred trees at Mt. Yoshino, and it has become a mountain where you can enjoy a wonderful view of cherry blossoms like this. It takes 30 minutes to walk from Yoshino Station to Shimosenbon slowly. The Shimo Senbon (lower) area encompasses the base of the mountain around Yoshino Station and the lower part of the town. The Yoshino Ropeway bypasses the steep ascent between the station and the town, but waiting times for the ropeway can get very long during the peak of the season. Lots of cherry trees are planted along the road up to the town, making the ascent on foot an attractive alternative to the ropeway.The shoots of the autumn leaves, called "spring maple," are beautiful, and the collaboration with Senbonzakura is a wonderful scenery.